Cream butter, white and brown sugar. Add eggs one at a time, then the vanilla extract. Using a wooden spoon add sour cream, mashed bananas, flour, baking soda and salt. Spoon into greased muffin or bread pans and bake for 35-40 minutes. Love these! Very moist and not overly sweet. 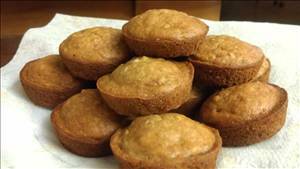 There are 159 calories in 1 serving of Sour Cream Banana Muffins.